Need an external hard drive but don’t really know what you’re looking for? Well here at Ink N Toner UK, we’ve got your back. There are two types of external hard drives: desktop hard drives and pocket hard drives. Pocket hard drives are hard drives designed to be transported are and do not need a power adaptor. These kinds of hard drives usually top out at 2TB, but 500GB and 1TB capacities are most common. Capacity: What do you need the hard drive for? Need it for photos and videos? You’ll need a higher capacity. Wireless or wired? Desktop hard drives are almost always wired. 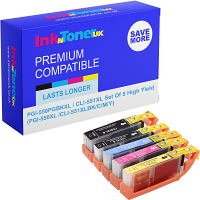 Get affordable external hard drives at Ink N Toner UK. Click here to view our range of 1TB external hard drives. Click here to view our range of 5TB external hard drives.